The history of Voorhees is quite extensive and interesting. Voorhees is 11.6 square miles and was named in honor of Foster McGowan Voorhees, the governor of New Jersey who granted the petition for Voorhees to become a separate township on March 3, 1899. “Voor” is a Dutch prefix for “in front of.” “Hees” was a village near Ruinen, Drenthe, Holland. Although Asphalt Pavement Solutions was not around at the time to provide quality asphalt maintenance services, we have been taking care of asphalt surfaces for more than 30 years. 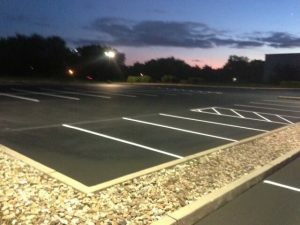 We currently provide routine maintenance, asphalt repairs, parking lot striping, Sealcoating, Voorhees, NJ, and many locations in Pennsylvania and New Jersey. Asphalt is a remarkable pavement material. It is durable, strong, environmentally friendly and economical. Given proper care, asphalt pavement in Voorhees or any other town can last for many decades. However, neglect can cut the pavement’s useful life by half or more. The stability of the foundation that supports the pavement is critical to the asphalt’s ability to retain its flexibility and withstand the loads placed on it. If potholes and cracks are neglected, water can penetrate to the foundation and destabilize it. Lacking the support it needs, the pavement can suffer severe cracking and deteriorate so badly that the entire surface may need to be replaced. Asphalt Pavement Solutions encourages all property owners to have damaged asphalt professionally repaired as soon as the damages are noted. We provide a full range of asphalt services, including crack filling, sealcoating and parking lot striping, to customers in Voorhees, NJ. To obtain your free quote, you can send us your information via our online form, or call 1.856.461.1710, 1.856.544.3990 or toll-free at 1.800.559.SEAL. Asphalt Seal Coating – Protect and extend the life of your pavement investment with high quality seal coating. Sealing your pavement within the first year of installation, and regularly thereafter, can greatly extend — even double — its service life. Find out more about our Sealcoating, Voorhees, NJ! Asphalt Crack Sealing – As asphalt ages and loses its flexibility cracks begin to form on the surface. If managed with ongoing maintenance these cracks can be filled to keep the water out. If left untreated, water will penetrate the cracks and destroy your asphalt investment. Learn more about our Voorhess, NJ asphalt crack sealing services! Asphalt Repair – As asphalt ages it forms defects that must be addressed. Even when they are minor, these problems can quickly deteriorate and greatly shorten the life of your pavement. Learn more about asphalt repair in Voorhess! Trust APS with your asphalt maintenance in Voorhees, NJ. We can also offer a complete pavement maintenance program including asphalt crack repair, asphalt sealcoating and asphalt repair to extend – and even double – the life of your pavement. Call 1.856.461.1710 for a call today!